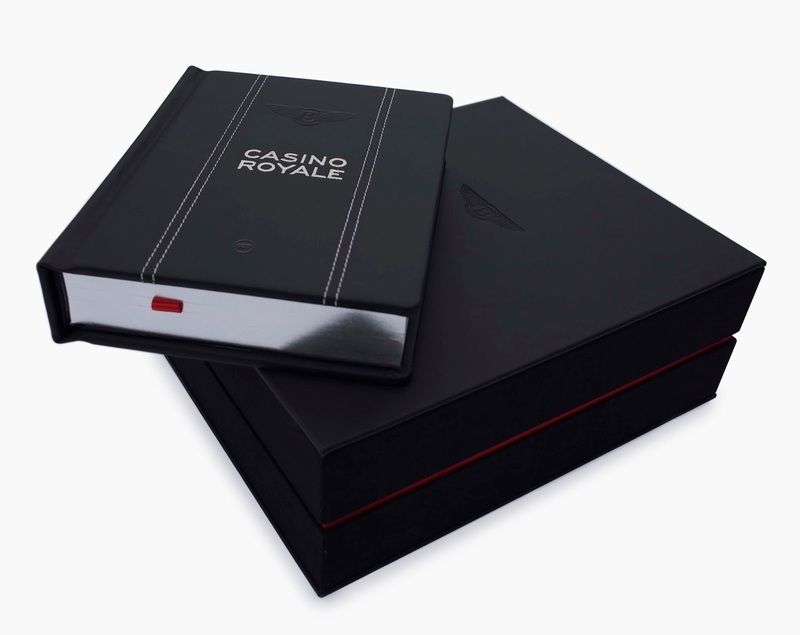 As part of the James Bond celebrations this week to continue the 60th anniversary of Ian Fleming’s first James Bond novel, Casino Royale, it is today announced that Vintage Classics has partnered with Bentley Motors to create a luxury limited edition of the book that introduced Special Agent 007 to the world. The special edition features an exclusive introduction from racing legend, Sir Stirling Moss, making it a true collector’s item. Just 500 editions will be produced, each costing £750. The Bentley is James Bond’s car of choice in the original Fleming novels and Ian Fleming was a huge admirer of the Bentley Boys, seduced by their adventures on the racing track. In his introduction, Sir Stirling Moss comments: ‘When it came to cars Fleming really knew his stuff… he must have known that the fabulous pre-war Bentleys won at Le Mans four years in a row from 1927-30.’ This iconic edition aims to capture that spirit of adventure and the glamour associated with these leading British brands. 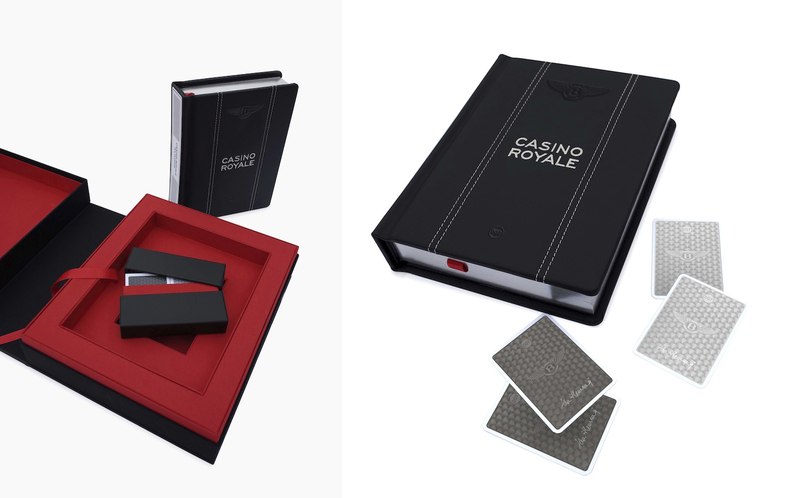 From the hand-bound beluga leather casing to distinctive Bentley features such as hand-stitched embroidery and silver foil page edges, this special edition of Casino Royale is produced with only the very finest materials. Its striking red, white and black colouring is a nod to the gambling theme of Fleming’s first novel, where Bond famously takes on his adversary, Le Chiffre, over a game of baccarat. A special feature of this edition is the bespoke set of playing cards, hidden within a secret compartment. * Presented in an elegant leather clamshell case, this edition of Fleming’s best-loved Bond book is an object of automotive craftsmanship. * The case and special edition are bound in beluga coloured leather, sourced from the tannery in Italy which provides hides for Bentley’s interiors. * Using Bentley’s craftsmanship, this edition features the iconic double stitching and signature winged Bentley logo – all hand stitched on the leather casing. * Bentley’s trademark knurling adorns the metal spine. This feature is inspired by the Bentley steel tread plate. * Each book has a limitation marque with Ian Fleming’s signature, reflecting the plate you would find on a Bentley engine. * Throughout each book are evocative brush illustrations by the Award winning illustrator Damian Gascoigne. * Removing the book from the clamshell reveals a hidden compartment. Within this secret compartment lies a leather-bound case of Bentley Bond playing cards. Published on 13 April 1953 by Jonathan Cape, Casino Royale introduced James Bond to the world. The first print run of 4,728 copies sold out within a month. Following this initial success, Fleming went on to publish a Bond title every year until his death in 1964. It is in Casino Royale where 007 first utters the immortal line ‘Bond - James Bond’ and where Bond first reveals his recipe for the famous Martini cocktail, christened the ‘Vesper’ after the first Bond girl, Vesper Lynd. 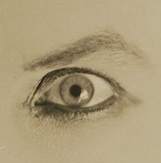 The artwork for the original cover was designed by Fleming himself, decorated with a heart motif to reflect a playing card. 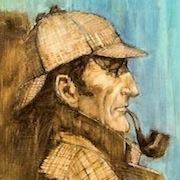 2013 is an exciting year for Bond publishing. Earlier this year to celebrate the 60th anniversary of Casino Royale, Random House –which houses Fleming’s original publisher, Jonathan Cape - released new editions of Fleming’s non-fiction books Thrilling Cities and The Diamond Smugglers. Today, Jonathan Cape published the next authorised James Bond continuation novel, Solo by William Boyd. The book is available from 1st November 2013 exclusively from Random House and is available to customers globally, excluding the USA and Philippines. Orders can be placed through a dedicated Random House phone number. ‘We knew that any design we came up with would have to reflect the incredible craftsmanship and heritage we had seen in the Bentley cars at Crewe, the challenge for us was how we could combine this with the coolness and nostalgia of Bond. We were inspired by all the details we saw at Crewe from the iconic double stitching of the leather interior, the power-lines of the body work, the machine turned panels, embroidered head rests, to the bright works of the engraved tread-plates and the engine limitation plates. The inspiration was endless. 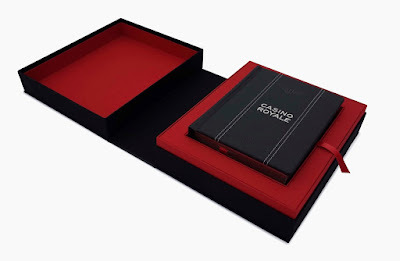 For visual references from the book the casino setting seemed an obvious place to start and we felt there should be a strong visual link to the imagery associated with casinos and playing baccarat. The colours of the playing cards, the textures and the excitement of the casino itself informed our choice of colour palette of black, white and red of the nine of hearts. As Bond’s fate hangs on the turn of the nine of hearts card, the idea came to us that if we could hide some playing cards within the book it would both increase the feeling of interaction as well as reinforcing the sense of espionage. We wanted the book to have unexpected elements and a playfulness. We wanted to enhance the enjoyment of the book for our readers by embellishing the pages with evocative brush illustrations. Award-winning illustrator Damian Gascoigne was commissioned to highlight key points from the text with simple line, giving the pages an energy that embodies both the thrill and excitement of the book. They give glimpses of the plot whilst providing a decorative balance to the text design. The black leather box is a clam shell design of impressive scale when opened. We wanted this to have real impact and to echo the desire for the unexpected we had seen at Bentley we chose to line the box with a shock of red, only visible in a small flash from the outside. 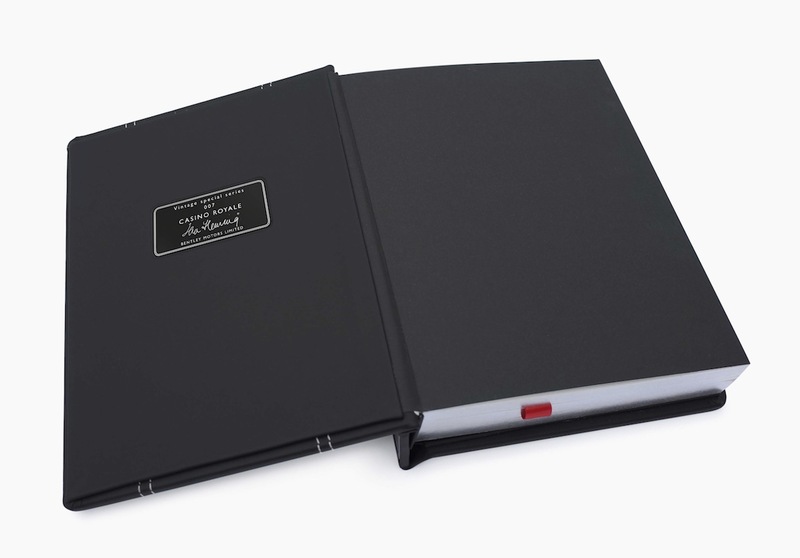 The book itself sits proud from the box and is bound in the same leather highlighting the craftsmanship of Bentley with the use of embroidery on the title and logo and the double stitching. Lastly we incorporated the tread plate design we had seen at Bentley for the spine, which has its own metal plate set into the leather, this has been echoed on the page edges with the use of silver foil. The Casino Royale Bentley Special Edition will be released November 1st, 2013 exclusively from Random House and is available to customers globally, excluding the USA and Philippines. Orders can be placed through a dedicated Random House phone number. With thanks to Ceri Maxwell of Vintage Books. That IS awesome... but not something I'm remotely in a position to afford! Somehow I'll manage to live without owning this one. Yes, just beautiful. With a great book inside it too. Thank you so very much for the information you have provided, I have managed to order a copy of this beautiful book. I wonder why there is the USA exclusion? Yeah, that is strange. But it's probably part of the (recent) deal struck with Amazon as the new publishers of Fleming in the U.S. They might have exclusive rights.